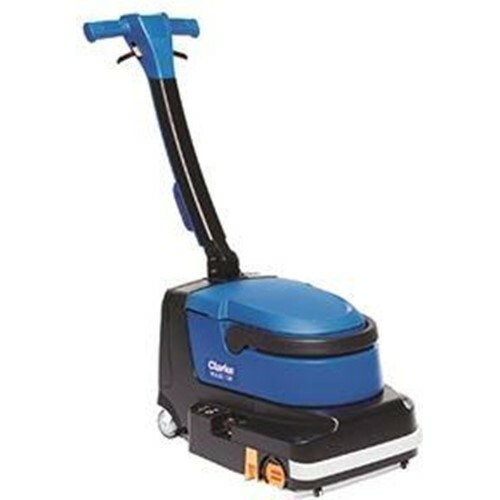 The battery powered Clarke MA30 13B micro scrubber delivers the cleaning performance you require in the compact size you need. Dirt and even small debris are easily removed from the floor with its single pass sweeping, scrubbing and drying capabilities, efficiently leaving your floors clean and dry. A user-friendly control panel in the handle is easy and simple to use and scrubbing action is easily engaged by simply placing your hands on the innovative touch points integrated into the handle. Two solution flow settings provide the flexibility of increasing the water flow settings provide the flexibility of increasing the water flow during extra tough cleaning tasks- ensuring effective cleaning and maximizing productivity. Effective - Sweep, scrub and dry in a single pass. Compact - Ideal design for scrubbing small spaces quickly. Safe - Cord-free and quiet operation. Sanitary - Creates a cleaner environment than mopping. With its compact, highly maneuverable design, the MA30 13B is ideal for scrubbing in tight corners or under tables or chairs. The adjustable and fold able handle makes transport and storage easy. Easily raise the front squeegee to sweep up small debris while scrubbing, thereby minimizing the need to pre-sweep. Designed to pick up water in forward and reverse directions, the MA30 13B ensures a clean, dry, more hygienic environment while decreasing chances for slip and fall accidents. The MA30 13B uses a powerful 36 V Lithium battery that provides up to 40 minutes of run time and operates at only 66 dB A, Allowing for daytime cleaning and cleaning of noise-sensitive areas. The cordless design ensures a safer cleaning environment and flexible cleaning options. Easily access the debris tray to empty and clean. Tank-in-tank design for easy handling when emptying and refilling. Two solution flow settings and a low solution indicator light and battery level indicator ensure effective cleaning. Powered by an easily accessible 36 V lithium battery optimized by BMS (Battery Management System) that monitors and optimizes battery performances, ensuring a safe, efficient energy source with a long life. Easy to maintain with tools-free brush and squeegee removal. Adjustable, ergonomic handle with built-in touch sensors that simply and safely engage scrubbing action. Handle also folds over for easy transport and storage. 1. Lithium battery technology and Nilfisk BMS (Battery Management System) to increase battery efficiency. 2. Recovery tank and battery covers are magnetically secured, allowing easy removal and replacement. 3. Parking pedal enables easy transport and helps avoid damage to the brush and squeegees when machine is parked. 4. Pivoting wheels on the back ensure high maneuverability even in narrow spaces. 5. One-Touch button for switching on and off all the machine functions, and palm sensors easily engage scrubbing action. 6. Two solution flow settings and a low solution and battery level indicator lights ensure efficient cleaning. 7. Dosing cap makes adding the right amount of detergent much easier. 8. Debris tray effectively captures small debris. 9. Squeegees and brush lock into place with an audible click to ensure proper installation. 10. Adjustable brush pressure knob to optimize required cleaning intensity. 11. Front squeegee can be raised to pick up small debris while scrubbing. 12. No tools needed to inspect and replace main components like brush or squeegees.